Intel is bringing peer-to-peer computer networking capabilities to Thunderbolt 2 with a feature that allows Macs -- and soon, PCs -- to connect directly for high-speed data transfers. With the Thunderbolt Networking feature, users can connect two Macs for a peer-to-peer connection and then transfer files directly. That reduces the need to use an external hard drive, USB stick or a local network for file transfers between computers. For now, the feature is available for connections between Macs through the OS X Mavericks operating system, but users will soon be able to establish PC-to-PC or PC-to-Mac connections when a driver for Microsoft's Windows OS is released. "By offering simple and fast file sharing, Thunderbolt Networking enables backup or upgrade across two computers like never before, using existing cables and connectors," said Dan Snyder, an Intel spokesman, in a Monday blog post on Intel's website. The new feature is a key addition to Thunderbolt, which has struggled to find adoption due to the high prices of cables and accessories. Thunderbolt 2 is used mostly to connect external storage devices, high-definition video cameras and monitors to Macs and PCs. USB remains the dominant connector technology. Intel said Thunderbolt Networking emulates an Ethernet connection and provides throughput similar to 10 Gigabit Ethernet, in which data packets are transferred at 10Gbps (gigabits per second). Thunderbolt 2 provides a maximum throughput of 20Gbps, which is two times faster than USB 3.1. Thunderbolt technology supports PCI-Express protocol for data transfers, and DisplayPort for monitors. 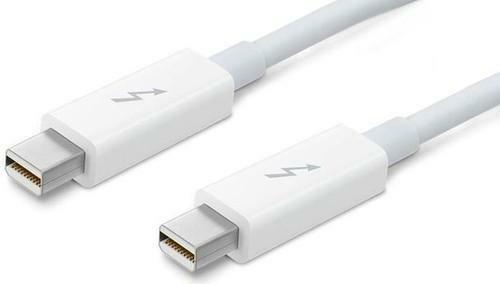 Intel is developing faster Thunderbolt technology that will be able to transfer data at 50Gbps. However, Intel is biding its time to release the faster Thunderbolt as the company considers the current throughput adequate for PCs. The Thunderbolt Networking technology was announced and demonstrated by Intel at the NAB trade show in Las Vegas.